A responsive web app for a Canadian startup that makes it easy to coordinate team sports. 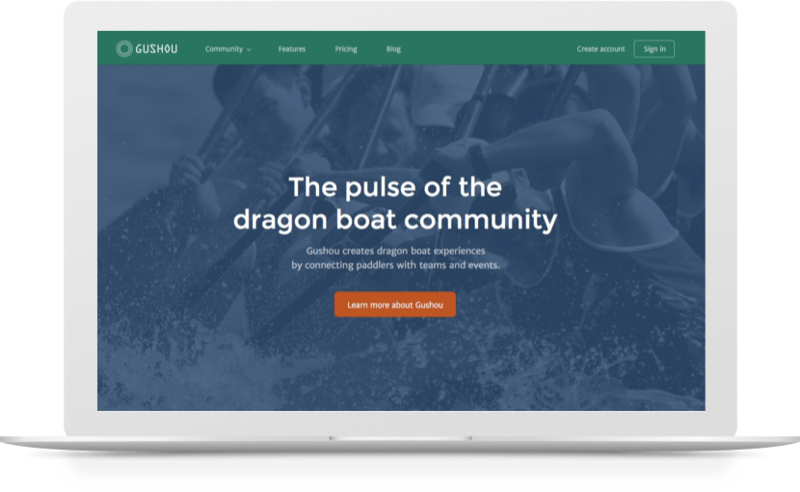 Dragonboating is taking the world by storm and we were approached by PaddleCore to work on Gushou — a bespoke platform specially tailored for the dragon boating community. The platform connects paddlers, team captains, clubs and event organizers with one another, making organizing and participating in events as frictionless as possible. Our responsibilities here consisted of improving the UI and UX of the existing web app, as well as adding new features in a phased manner. As part of the UI overhaul, we created a style guide consisting of typographic recommendations, new icons, a grid system and button styles. We decided to keep the design simple and elegant while letting the backend technology do all the heavy lifting. A calendar module that allows users to setup and purchase practice slots. A team management module for creating and managing teams and rosters. An intuitive UI for creating team lineups that features drag-and-drop functionality. To announce the new features and market the app further, we created a microsite consisting of a landing page and other pages detailing the new features, plans and pricing, etc. People have said nice things. In addition to being extremely competent, creative, and adaptable; DCCPER has been able to provide industry insight and knowledge that is helping us create a product that will be around for the long haul. We are confident that DCCPER has our big picture objectives in mind and will help us realize our goals and potential.